I worked in Glasgow periodically in the 1980s so retain an interest. Headlines from The Scotsman arrive daily by e-mail. This story about a Russian refugee family that fell from a 15th floor is awful but it was the accompanying image that caught me. 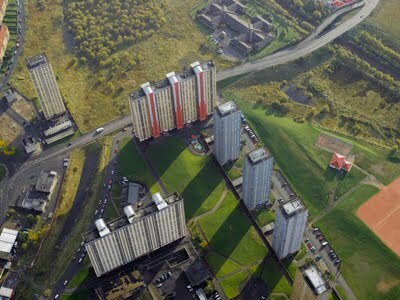 Red Road flats are apparently notorious. A quick search describes them visually. 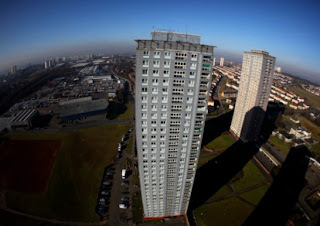 Eight 31 storey blocks on the outskirts of Glasgow husing 4,000. The tallest social housing in Europe when built in 1971 according to one report. I was unaware of them. When I lived in London I accompanied my not-well-to-do brother looking to buy a flat (which I would also inhabit). We looked at some awful life-sapping dives. Yes, even the private sector built revolting concrete blocks. Some that were comfortably habitable inside looked straight into the neighbour's windows and had virtually all natural light curbed as a consequence. The sense of claustrophia was crushing. I suppose in their favour these Scottish blocks are at least well-spaced providing some daylight and view. My psyche craves physical space and light and a horizon. Personally I would rather be in flat with an unimpeded view than in a pokey terrace house with a garden the size of a postage stamp. 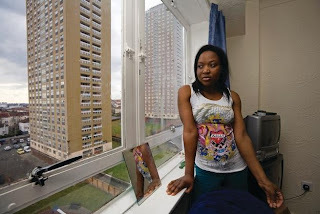 But the flats are earmarked for demolition. What will replace them I wonder? Is this a classic case of the left hand not knowing what the right hand is doing? Labour's policy is to introduce one year's Paid Parental Leave (PPL). One of their MP's has just had a private member's bill drawn from the ballot to introduce 6 months PPL! If Paid Parental Leave is such a great thing why not lobby for 2,3 ,4 or 5 years entitlement? Oh, of course, we already have that. It's the DPB. And a fine job its doing of reaping "social and economic" rewards. In the final analysis PPL is just another scheme that forces one person to pay for another's choices. That's the principle we live with and its arbitrary application is what keeps far too many politicians, paid lobbyists, media and public relations people, unionists, etc non-productively employed. Here's a couple of sub-stats. In absolute terms there were 20,289 fewer recorded crimes in 2011 than in 2010. In Canterbury there were 11,579 fewer crimes - that's 57 percent of the total. David Garrett says the drop in crime is down to better policing and three strikes. He may be right that these two factors are reducing crime. But Earthquakes would have to be right up there. In Waitemata and Counties Manukau there were 1,614 fewer crimes but in Auckland there were 4,229 more. So I fervently hope that a downward trend is being established but would be foolish to get overly excited. My comment: This shows the double whammy for the economy. The state has to find more money to support increased student numbers while receiving less tax revenue from the numbers employed. Latest data (first half of 2011) shows a further 3.5% increase on 2010. During the recession, New Zealand experienced a smaller rise in unemployment than a number of other OECD countries. It is possible to compare New Zealand’s unemployment rate with other countries using the seasonally adjusted harmonised unemployment rate published by the OECD. Over the recession, New Zealand’s unemployment rate rose 1.2 percentage points. During the same period, the unemployment rate rose 3.3 percentage points in the United States, 2.0 percentage points in the United Kingdom, and 1.2 percentage points in Australia. The recession in 2008 and 2009 in New Zealand and the rest of the world continues to affect the New Zealand labour market. There have been falls in employment, falls in hours paid and worked, as well as rises in the number of people unemployed. People have responded by leaving the labour force. In some cases, they have decided to do more tertiary study. These factors have affected companies to varying degrees, depending on firm size. The impact of the recession on the New Zealand labour market will continue to be felt for a long time. I am only posting this out of mild amusement such has become the pervasiveness of the state in our lives. If you suspect you are in a dysfunctional relationship take one of Nanny's quizzes to either confirm or allay your fears. Welfare State meets Woman's Day. The New Zealand Wars were hardly over when the Vogel period of immigration and public works began. As a rule, Maoris are middle-sized and well-formed, the average height of the man being 5 ft. 6 in. ; the bodies and arms being longer than those of the average Englishmen, but the leg bones being shorter, and the calves largely developed. * The skin is of an olive-brown colour, and the hair generally black; the teeth are good, except among the tribes who live in the sulphurous regions about the Hot Lakes, near the centre of the North Island; but the eyes are bleared, possibly from the amount of smoke to which they are exposed in “whares,” or cabins, destitute of chimneys. The voice is pleasant, and, when warlike excitement has not roused him to frenzy, every gesture of the Maori is graceful. Nothing can be more dignified than the bearing of chiefs assembled at a “runanga,” or council, and this peculiar composure they preserve when they adopt European habits and custom, always appearing at ease, even in the midst of what would seem a most incongruous assembly. In bodily powers, the Englishman has the advantage. As a carrier of heavy burdens, the native is the superior; but in exercises of strength and endurance, the average Englishman surpasses the average Maori. As to the character of the natives, it must be remembered—if most opposite and contradictory qualities are ascribed to them—that they are in a transition state. Some of the chiefs are with the exception of colour and language, almost Europeans; others conform, when in towns, to the dress and the customs of white men, but resume native ways, and the blanket as the sole garment, as soon as they return to the “kainga,” or native village. The great majority have ideas partly European, partly Maori; while a small section, professing to adhere to old Maori ways, depart from them so far as to buy or to procure articles of European manufacture, whenever they can do so. They are excitable and superstitious, easily worked upon at times by any one who holds the key to their inclinations and who can influence them by appeals to their traditionary legends; while at other times they are obstinate and self willed, whether for good or for evil. As is usual with races that have not a written language, they possess wonderful memories; and when discussing any subject, they cite or refer to precedent after precedent. They are fond of such discussions; for many a Maori is a natural orator, with an easy flow of words, and a delight in allegories which are often highly poetical They are brave, yet are liable to groundless panics. They are by turns open-handed and most liberal, and shamelessly mean and stingy. They have no word or phrase equivalent to gratitude, yet they possess the quality. Grief is with them reduced to a ceremony, and tears are produced at will. In their persons they are slovenly or clean according to humour; and they are fond of finery, chiefly of the gaudiest kind. They are indolent or energetic by turns. During planting time, men women, and children labour energetically; but during the rest of the year they will work or idle as the mood takes them. When they do commence a piece of work, they go through with it well; and in roadmaking they exhibit a fair amount of engineering skill. "...why is the taxpayer-funded ACC even expected to pay compensation to someone who, we now know, has already received a million-dollar payout from a private insurance company for her bicycle accident, the same accident for which she's seeking an ongoing benefit from ACC?" ACC is partially tax-payer funded but anyone in employment or self-employed pays premiums, often very hefty ones. If Bronwyn Pullar paid premiums, and if her injury fit the bill, shouldn't she be entitled to an ACC pay-out?And if Bronwyn Pullar paid taxes shouldn't she be entitled to an ACC pay-out? The fact she took out private insurance as well shouldn't have any bearing (unless, of course, she was setting out to get injured which seems highly unlikely). But this is the lie that is ACC and social security in this country. You make compulsory contributions with no guarantee of cover. Our system is a sort of hybrid between insurance, social assistance and wealth redistribution to the poorest. Either government schemes should make pay-outs linked directly to contributions or let people make their own provision (while maintaining a separate pool for non-contributors). As it stands we get the morally repugnant but legally defensible situation of Ms Pullar getting two pay-outs and still wanting more.